After being home-schooled for the majority of his education, Lee Tobin's first taste of the formal education system came when he studied for a BTEC Diploma in Construction and the Built Environment (Building Services Engineering) at City of Westminster College. He quickly demonstrated his potential, graduating with a double distinction. "My BTEC confirmed that a career in building services engineering was the right direction for me," says Lee. "I took a year out between finishing the course and starting at university, but there was never any doubt for me about where I wanted to study – LSBU." 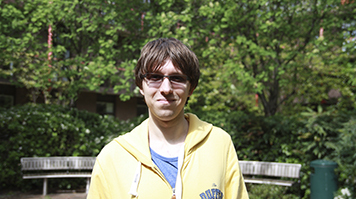 Lee's determination to study at LSBU was a combination of various factors. "Lots of people at my college talked about LSBU as a great place to study for a degree," he says, "and it was within commuting distance of my family home. Most importantly though, LSBU has a great reputation within the industry." LSBU is a world-leading institution for building services engineering education, and around half of those working as consultants in the field have passed through the university. Now into his second year on the BEng (Hons) Building Services Engineering, Lee can see why LSBU is held in such high regard. "The lecturing staff are internationally recognised, so I know that my degree will carry a lot of weight when I graduate," he says. "They have been extremely supportive and helpful too, and they have put a lot of effort into sourcing opportunities for students on the course." It's those opportunities that Lee is hoping to make the most of as he pursues his dream of moving into engineering consultancy. "Many companies contact LSBU looking for graduates or work placement students, which makes it much easier to enter the industry," he says. "There are lots of chances to make contacts and network – in fact, I had a one-week plant room tour with a maintenance department in a large building that came about thanks to a contact I made through group study on the course." There's little doubt that Lee is thoroughly enjoying his time at LSBU, and he feels that his higher education journey might not end when he graduates. "My short-term goal is to work in engineering consultancy and work in the field, but I'll always want to remain actively involved with LSBU," he says. "Longer-term, my goal is to invest heavily in education to help me become the best engineer I can be, but I haven't decided whether I want to study a wide range of skills to a good level, or focus on one specific skill and taking myself through to PhD level."